As much as I absolutely LOVE driving, the thought of getting in the ILX for another 22 hours of drive time to get home to Phoenix, Arizona was pretty daunting. For the first leg, at least, I had some co-drivers. Jodi took a turn, too. She said it’d been 2 years since she’d driven a stick shift, but she got the hang of it quickly! In Logan, Utah we dropped off two passengers and lightened the load a bit. 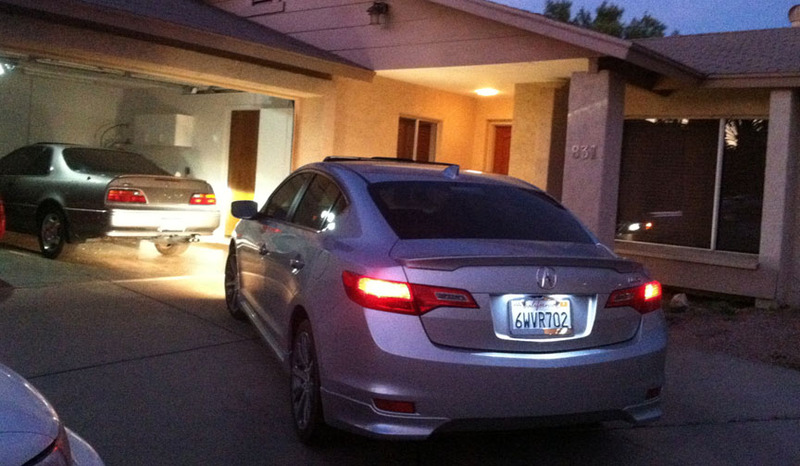 I was able to spend the evening with my dad and give the car one last rest before the final stretch. Grandma and I were up before sunrise and out the door with plenty of road snacks to keep us fed. My favorite things to munch on are Rice Krispy treats and string cheese. We had both! 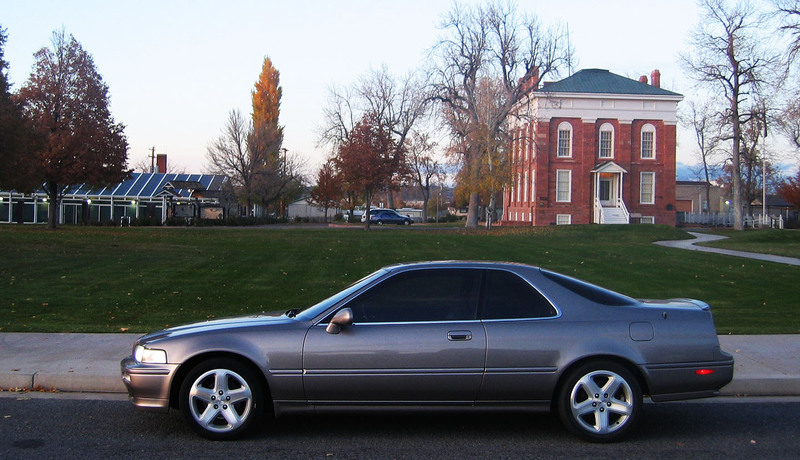 We made a restroom stop in Fillmore, Utah off Interstate 15. Fillmore was the state’s capitol until 1856 when the legislature decided to move the capitol to the larger area of Salt Lake City. The original statehouse is still standing today (below). I had last visited this site in my Legend in November 2006. It sure hasn’t changed much in 7 years. Or in 158 years, for that matter. At a stoplight later on, I looked to my right and saw this. 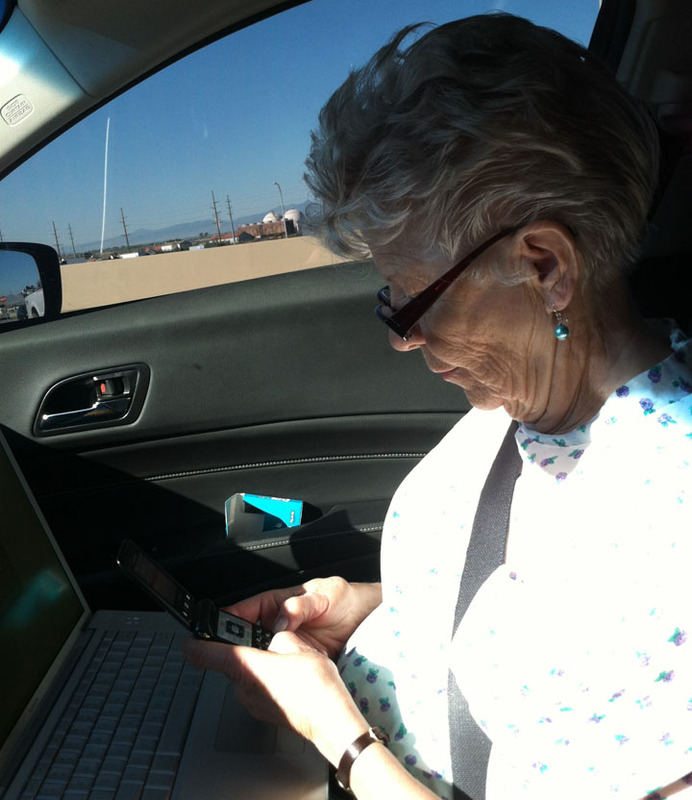 How many 81-year-old people do you know who multi-task with laptop computers and text messaging while on a road trip? Grandma never slows down! Viva Las Vegas! Just 4.5 hours from home at this point. 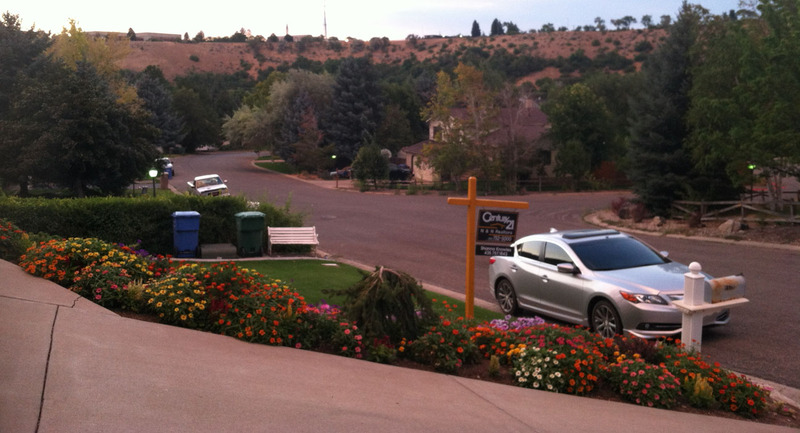 And finally, at long last, I pulled into my driveway and breathed a sigh of relief. To wrap it all up, here’s a 7 minute video capturing just a few of our weekend’s highlights. You’ll get to see us visit homes my grandma had lived in 70 years ago, see some pictures of Grand Coulee Dam, and retrace the steps of that 1950 automobile accident that my grandma walked away from. 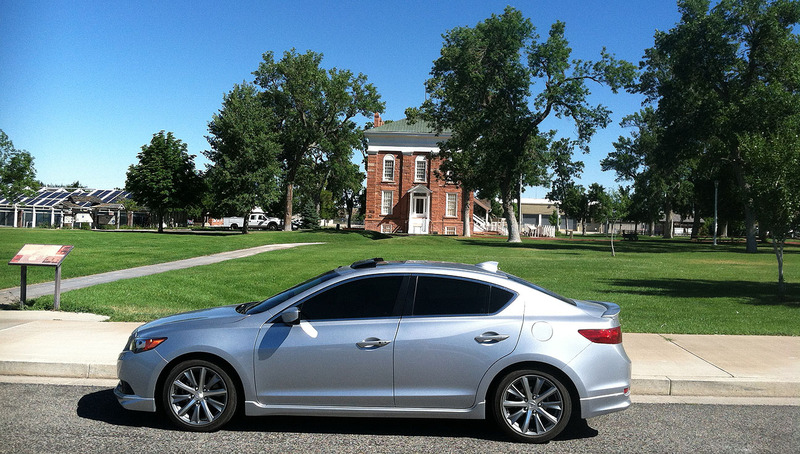 This entry was posted on August 17, 2013 at 2:37 pm and is filed under ILX, Road Trip. You can follow any responses to this entry through the RSS 2.0 feed. You can leave a response, or trackback from your own site. 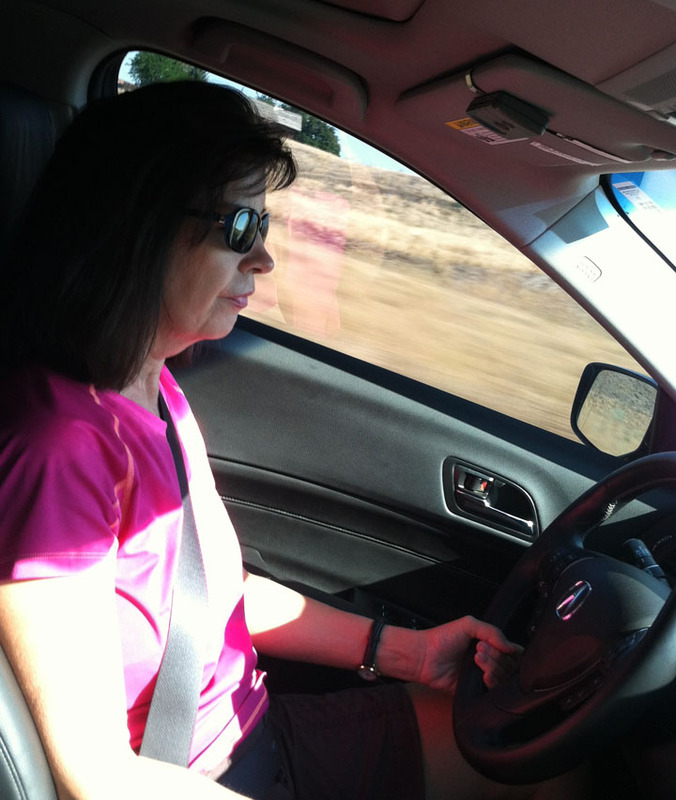 So check out how Jodi and I are each holding the steering wheel as we drive your car…. (first two photos). Scary. This is a really fun set of posts and I take personal interest in them — more than usual. If you and your car had not been able or willing to make this excursion happen, we might all be in s state of depression right now. Happy trails! You and Jodi are the same person, I swear! Thanks for being a part of the adventure. Let’s plan another drive soon! I just flipping LOVED each of these posts about the reunion trip, especially the video which capped it off so perfectly! What memories you have preserved! These will be cherished more and more through the years. THANK YOU! Hey Jodi, glad you enjoyed the posts! The video was my favorite part. I had a ton of fun putting that together. Looking forward to our next road trip together! Jason, yup, front end is all cleaned up! Thanks to that Clear Bra, I really don’t have any rock chips yet, either. I highly recommend a trip to WA – I certainly plan to make it back there sometime in the not-too-distant future. Awesome. I’m already looking at the schedule to see if I can sneak back into Colorado to attack Pikes Peak within this year.